LiftSeat powered toilet lifts support your safe patient handling and fall prevention programs with the industry's most trusted solutions. Both the LiftSeat LS450 and LS600 Powered toilet lifts deliver safe, stable, easy to use toilet transfer assistance. This reduces the force required to transfer patients and controls their rate of elevation to greatly lower the risk of orthostatic hypotension related falls. 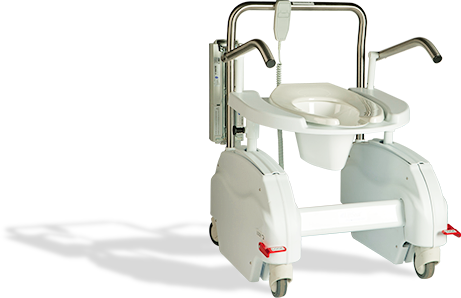 LiftSeat wheels easily from room-to-room, then bedside to bathroom for use over the toilet or as a powered bedside commode. LiftSeat helps reduce "never events" (falls, hospital-acquired infections, LS600 deep vein thrombosis, bed sores, catheter infections. 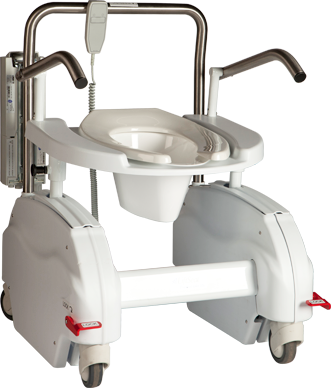 LS450: Our flagship powered lift wheels easily and locks in place anywhere for use bedside or over the toilet. LS600 Bariatric Toilet Lift: Offers the same usage flexibility and features as the LS450 with a weight rating of 650 lbs. 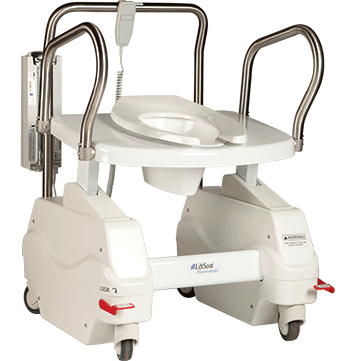 LiftSeat® toilet transfer solutions increase caregiver and patient safety by reducing the risk of falls and eliminating the need to lift patients in a wide range of clinical applications. Many patients cannot be assisted with toileting through traditional sling-based lifting equipment due to their condition or injury. In addition, the cost of tracking these lifts into facility bathrooms limit their usefulness for toileting. We have compiled the following clinical resources to help you learn more about safe patient handling and fall prevention programs and how LiftSeat® toilet transfer solutions support these critical healthcare initiatives. ©2019 LiftSeat Corporation. All rights reserved.